It’s 8:30 p.m. and we just came home from daughter Elizabeth and Timothy’s house. Elizabeth made supper for us. She made cooked potatoes, cooked carrots, corn, Sloppy Joe sandwiches with ice cream for dessert. It was nice to not have to cook supper tonight. And it was a wonderful evening to eat out on their patio. Mose and daughter Susan and Jennifer also came over to eat there. Elizabeth and Susan were here today with their little sweeties Abigail and Jennifer. Elizabeth asked if we want to come over for supper so we took up the offer. Tomorrow son Kevin and I will travel to the children’s hospital in Ann Arbor. He has an appointment with the surgeon that did our daughter’s surgeries. It’s such a big hospital and I still get turned around so I am always glad when my husband Joe can go along. This time he won’t go along as they were off so many days and with the four-day work weeks they are having he’s glad for every day he can work. Next week he will have to take a day off for a dentist appointment with a specialist and possibly have surgery to remove a tooth. The glue that my husband Joe used to fix my washing machine hose last week gave up. Daughter Loretta and I wanted to do laundry on Monday so I used Gorilla glue to glue the end back on the hose. I didn’t know that glue swells up so when I wanted to drain the water from the wash machine it wouldn’t come out. The glue had swelled up enough to plug the whole inside of the hose. I had to break the glue back out so now before we wash clothes again the hose needs to be repaired. I did figure out that you need to use Gorilla glue sparsely. Mornings have been foggy lately. I’m hoping it won’t be tomorrow morning when we travel the two hours to the appointment. Our one garden is all cleared out and tilled now. Not much left in the garden anymore. Autumn begins this week already. Its always nice to finish up the canning season from the gardens. I am so thankful though for every jar that was filled and all that could be frozen. 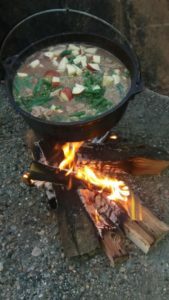 Friday night we made a kettle of campfire stew outside in the kettle over the open fire. It was a nice evening to sit around the fire. We used fresh potatoes, green beans, and onions for the stew along with chunked steak from our freezer. It was delicious. Our thoughts went back sixteen years ago on Monday, September 17, when dear Mother, Elizabeth Coblentz, passed away. She was in Blue Springs, Missouri, when she so suddenly passed. So far from home and we felt so helpless when we heard the news. I started penning the column after her. Joseph, 16, was just a couple months old. Mother will always be remembered. Life goes on but we still have our loved ones close in our hearts! On our way home tonight from Timothy’s house we saw so many deer. One ran in front of our horse Midnight and startled her. But it was a very peaceful evening for a buggy ride. Signs of autumn are beginning to show on the trees. Folks are digging potatoes from the fields. Gardens are looking empty. I will share a recipe for stuffed cabbage with you. A good way to help use up your cabbage from the garden. I always plant the late cabbage. Until next week, God’s blessings to all! Remove core from cabbage. Scald cabbage in boiling water and remove leaves as they soften. Sauté onions in margarine very lightly; do not brown. Also sauté beef and pork. Combine meat with rice, eggs, sautéed onions, and seasoning. Mix well. Place 2 tablespoons of mixture in center of cabbage and roll. Wrap in bacon strips and insert wooden picks to hold together. Pour tomato sauce on rolls, then squeeze tomatoes from can and arrange on top of rolls. Sprinkle brown sugar and bake at 350 degrees for 1 hour or until done.